I know I don’t post very much on the blog in between each version. I usually just relegate most communication to Reddit or the Facebook page during this period, but I thought I may as well make a small update just to show you all what we are working on. Items with a durability of 1 or less now show up in red in your inventory/equipment/quickslots. Requirements now are shown in red in the tool-tip if you do not have the item, or enough items for the craft. 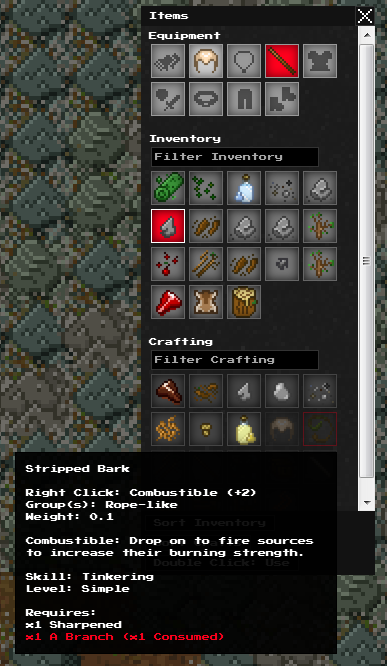 All items now have durability (no stacking in this build). Don’t worry, I am also working on some form of smart grouping system. But for now, definitely use the filter. There’s a few new items shown. There is now “fresh” water sources (in caves, ponds, oases) in which you can place into a Waterskin or Glass Bottle to drink directly. You can also boil fresh water to make it cleaner and less potentially hazardous to health. Fresh water does not need to be desalinated unlike sea/ocean water which still needs to be distilled using a still or Flask. Ranged (projectile and bow) items are getting an overhaul with how they work. There’s also a few new items for ranged combat. More information will be added about this in the changelog when ready. Beta 1.5 will be coming very soon. I promise! What is the purpose of milestones? Are they only for the current run or do they persist across the games giving you some bonuses when starting a new game? They currently are for each game (they don’t transfer over), this is because they provide stat and skill bonuses once you reach or discover them. Although, I’d definitely like to include more things that carry over between games, some form of unlockables. Who knows, maybe I will make the change so that milestones carry over, and when starting, you get the bonuses right away. Might have to balance that a bit though.